Can we meet with you for a consultation? If so, what will it cost? Are your coaching programs identical? Are they all different? How much does your coaching program cost? Who will you wish to interview in our company before you design our program? Are assessments necessary for your coaching programs? We do internal assessments with our preferred 360° tool. Will you integrate them into the coaching program? Does it matter if we have not previously outsourced coaching for executive or leadership development? May we specify which development areas should receive the most focus? What training will need to be conducted prior to a leader’s participation in your program? How do you accommodate our busy schedule and travel obligations? How do you ensure the coach has sufficient knowledge regarding our company objectives? How will sessions be conducted — by telephone, videoconference, or in-person? Is virtual-coaching as effective as in-person coaching? How will you determine the leader’s attitude toward participation in the program? How do you determine which of your coaches is best for each leader? How do we know your coaches are qualified to coach? Will we have an opportunity to review the credentials and meet with your coaches before sessions begin? What if my leader doesn’t like the coach that has been assigned to them? What are some of the optional components that we may choose to include in the design of our program? Can the program design include a way for me to prove the success of the program to my company? What is Shadow-Coaching? Should it be designed into my program? What should be the duration of a leader’s participation in the program? Once you have designed a program for us and we have begun it, is there a guarantee associated with your services?. 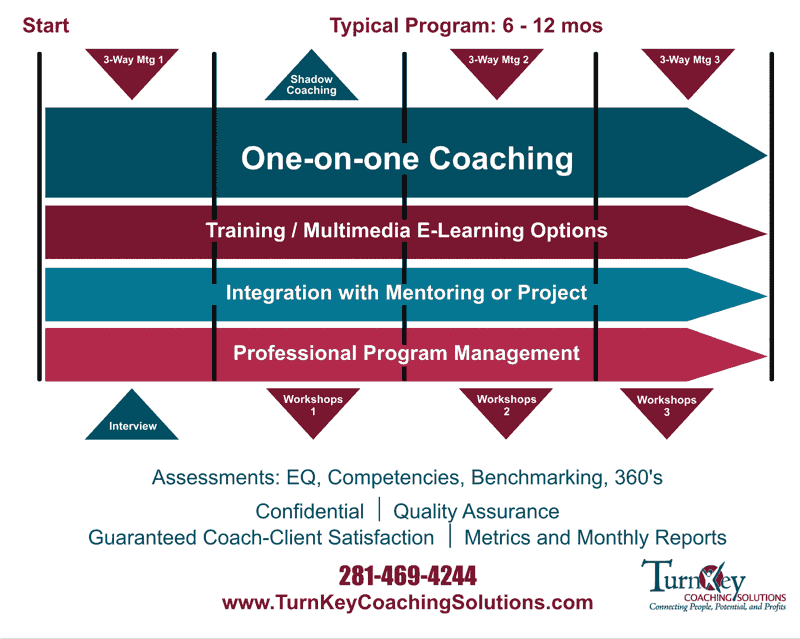 The Executive Coaching & Emerging Leader coaching programs of TurnKey Coaching Solutions (TKCS) are custom-designed to meet the needs of your organization and the individuals whom you select for participation. We coach executives and managers at all levels in a range of leadership development disciplines. In designing a program for you, we emphasize those developmental areas that you deem most important for each individual and for your organization as a whole. These FAQs relate to how we design an Executive Coaching or Leadership Development Program, or Emerging Leader Program for your executives, senior VPs, middle managers, and/or high-potentials based on your requirements, goals, and budget. The FAQs also apply to our Corporate Coaching Programs. In this context, the term “leader” refers to any employee who is a participant in your program. We also provide consulting for Emerging Leader programs, please inquire. Each coaching program that we design is unique in some respects and is similar in the leverage of best practices. In the design of your coaching program, we stress key developmental areas that you have identified as being the most important for your organization and for each individual leader. Each program’s uniqueness centers on its adaptation to your company’s culture, mission, vision, and internal HR processes. Your program’s singularity derives from which key developmental goals you have chosen to focus on and which leadership competencies each leader selects. Developmental areas include leadership, interpersonal effectiveness, communication, career development, organizational issues, time management, achieving revenue and performance objectives, work-life balance, innovation, employee turnover reduction, executive presence, managing resistance to change, and many other topics. Your program is designed to close the gap between where your leader is now and where you want them to be. TKCS programs are also alike in that they benefit from our years of practical experience and research in the fields of human behavior and leadership development. Substantial expertise has been gained from this experience, which we bring to bear in your engagement. Our suite of proven tools, methodologies, and features are adapted to your needs. We consider this degree of standardization in our programs to be a positive factor. All sharp edges in our processes have long since been smoothed. Practice makes perfect. Your company’s specific results will vary. However, coaching is a proven performance improvement tool. In fact, we encourage our coaches to work with each leader to set measurable goals so that the coaching efforts can be validated. Of course, this is often easier said than done. 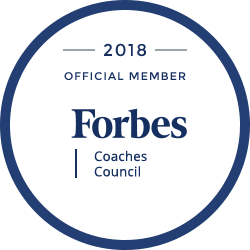 “A recent study shows an average return on investment of 5.7 times the initial investment in a typical executive coaching assignment, or a return of more than $100,000.” And when the indirect (but very real) benefits are added in, the ROI jumps to 788%! We have developed several coaching packages that are extremely affordable and an investment that makes smart financial sense! We offer different levels of participation which allow you to choose the program that is the best fit for your priorities and goals. All packages include a set number of months of individual, one-on-one coaching, combined with your choice of additional professional development options such as integrated training, multi-media eLearning modules, group coaching, shared intelligence sessions, collaborative project facilitation, assessments, 360′s and more. Give us a call to explore which option may work best for you and your company and we’ll happily provide an estimate and proposal. A company sponsor or key stakeholder may request a meeting with us to help guide us in designing of the best possible program. We seek input regarding your company’s culture, vision, mission, critical concerns, recent negative and positive events, and similar factors. We apply insights and materials that you provide to help our coaching team get up to speed quickly on the essential nature of your company and the goals that you have set for it. We can then better assist your team in the achievement of these goals. If the leader is requesting coaching support, then we value their input as well as their supervisor’s input regarding 360° feedback. Each person selected for coaching will identify those individuals who could provide meaningful feedback about them. Ideally, the leader would be amenable to receiving input from both fans and critics. If the leader is a part of an emerging leader or executive suite coaching program, then typically the HR sponsor or the leader’s supervisor will direct us to whom we may interview for a qualitative 360 and/or a survey for a quantitative 360. We also seek input through three-way meetings involving the coach, the leader, and the supervisor. These are open discussions that enable all three individuals to be sure that they are aligned with each other in their goals and the tasks before them. While assessments are not necessary, they are highly recommended. Imagine how difficult it would be to do repair work on a car engine without a manual. With enough time, effort, and focus, you could determine where all the key engine components are located and then get to work. With the manual, however, you could immediately locate these components so you could proceed right away with repairs. Assessments reveal a person’s “engine”; their preferences, dislikes, behavioral styles, communication methods, and other key components of their personality. Assessments provide clarity and insight that permit the coach and leader to move expeditiously toward the achievement of goals. Yes. We will integrate your internal assessment tool into the program. In fact, that is our preferred approach. Of course, this assumes that your assessment tool collects the information needed to satisfy your requirements and meet your objectives for the program. If this is not the case, we will recommend the use of additional assessments or a 360°. Our coaching program starts with a “welcome interview” form that is completed by the person being coached. When the right coach is selected, the leader will receive his or her coach’s contact information and instructions on how to make their first appointment. After their first appointment, they will work directly with their coach to schedule subsequent coaching sessions that are convenient for both parties. We use a sophisticated, on-line console for scheduling and for sharing information between the coach and the leader that makes the process robust, easy, interactive, and highly accessible for both parties. It matters only to the extent that we will need to communicate to participants the benefits of outsourcing to expert executive coaches like TKCS, who would otherwise be too expensive if hired as full time staff. Our talented team of coaches has coached for the following corporations (to name a few), and our coaches have coached for hundreds more. There are no specific training courses that serve as prerequisites to participation in our coaching programs. At your option, our leadership development workshops, conducted by our professional development experts, are available if you choose to include specific Leadership competency or other targeted training program. We can also consult on the development of your cross-company “Leadership University” programs. TKCS offers many training programs of value to your company, its executives and managers, and key personnel. You can review a list of our training courses here. In designing a program, we assume that each participating executive leader has a busy schedule, one that may include a certain amount of travel. We accommodate this condition by offering virtual coaching, which entails conducting coaching sessions by telephone or videoconferencing. Virtual sessions can be conducted conveniently from any location and during non-business hours. Before each engagement, we conduct coach team training sessions to ensure each member of your coach team is properly apprised of your organization’s unique culture, future plans and current objectives. Such information as company mission, vision, culture, leadership philosophy, mergers, acquisitions, and reorganizations are relevant as are the rate of growth and rate of employee turnover. Company orientation materials, leadership competencies (if identified), the most recent annual report (if available), and other materials are helpful to our coach training process. Certain clients prefer that leaders meet face-to-face with coaches to foster the formation of a personal bond. Others find it difficult for participating executives and leaders to meet in person with their coach due to their busy schedules. Thus, many clients prefer a virtual coaching approach involving telephone or videoconferencing sessions. For most clients, the flexibility of virtual coaching makes it a better fit, and, by reducing costs, virtual coaching enables more individuals to enjoy the benefits of the program. For those clients who seek the advantages of both approaches, we will design a program that integrates in-person and virtual coaching. Based on many years of firsthand experience, we have found that virtual coaching is as effective as in-person coaching. Additionally, for large companies requiring cross-organizational programs, virtual coaching provides an extremely affordable and effective alternative to in-person coaching. Coaching is only effective to the extent that the leader is open to the process, and ready and willing to change and grow. Coaching can be useful in some remedial situations, but again, only to the extent that the leader is eager for improvement and open to feedback. After you select a leader to participate in the program, we conduct pre-program interviews and ask him or her to complete a survey questionnaire. One of the objectives of the survey is to help us to select the right coach to interview for the assignment. Another is to determine the leader’s predisposition concerning the value of the program. If negative, then in the “Welcome Interview”, we will focus on justifying the program and explaining the benefits to the leader. If, despite this effort, the leader continues to be disconnected from the coaching process, we will inform both the leader and the company that coaching is not likely to achieve its goals. We will make recommendations about how best to proceed. Depending upon the scope of the engagement, we recommend that your leader interview two or three of the coaches we present for consideration. A good match between the coach and leader is critical to a successful engagement. By allowing each leader to make their own selection from our pre-screened and vetted coaches, your investment is justified at the very beginning of the engagement. 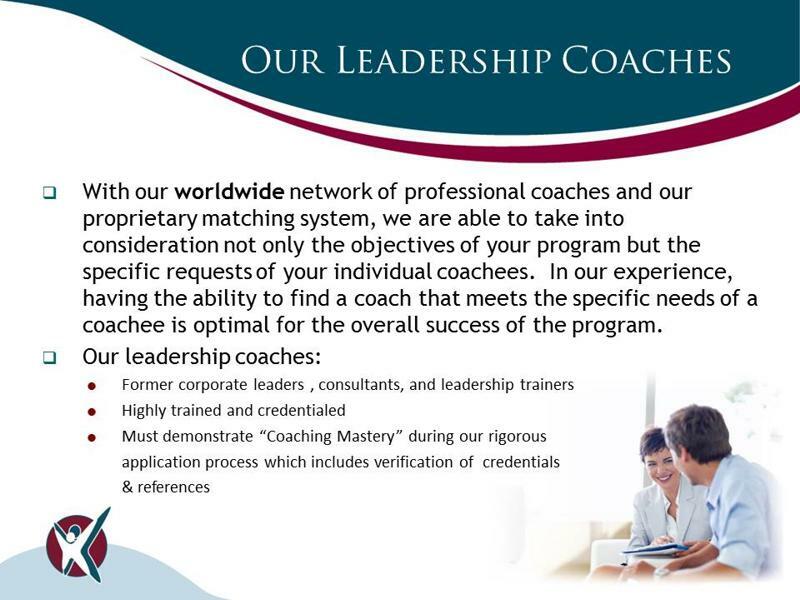 For enterprise-wide coaching programs, we also have very sophisticated methods for quickly matching the coach and leader. For example, our coaching program questionnaire produces valuable data. It provides us with a profile of the ideal coach for each leader. We then select the most suitable coach or coach team for each leader based on the coach’s corporate experience, education, training, certifications, style, and personality. We do this via our proprietary matching process that advances your program objectives and promotes leader satisfaction. Our bench of coaches is deep in talent. They all possess advanced expertise and a depth of experience in the coaching profession and their specific fields. They are certified by an internationally recognized certifying body, have impressive qualifications and relevant corporate and business experience, and have completed an advanced coach training curriculum. Specific requests or needs that you may have can be accommodated. Yes. A successful engagement is based upon a good match between the company’s objectives, the coach, and the leader. Not only do we recommend that you interview our proposed coaches, your leader should also assess the coach during the “Welcome Interview” (See Also How do you determine which of your coaches is best for each leader?). We believe a successful engagement depends upon the long-term compatibility of the coach and leader. Due to our rigorous screening and selection process, incompatibility is rare. However, should the leader become dissatisfied with his or her coach at any time during the engagement, we will immediately seek a better fit with another qualified coach. Should this situation arise, we will consider both the geographical location of the leader and the context and nature of the re-assignment. Please note that a suitable replacement coach may not be available for in-person coaching at your location. However, we always have ample virtual coaches for these situations. Depending upon your budget and objectives, features designed into your program may include verbal or online 360° assessments, multi-assessment integration, shadow-coaching, leadership development training courses, kickoff workshops for key corporate managers, group coaching, regular coach-leader-manager meetings, webinars, teleseminars, a metrics evaluation framework, email coaching, a Leadership Competency eLearning portal, HR surveys, and many others. Measuring progress in the area of leadership development is often a very difficult task. These are typically “soft” skills, so accurate measurements are elusive. That said, we have found that the best metrics in this area are based on establishing clear and comprehensive benchmarks at the beginning and then measuring those attributes at the mid-point and again at the conclusion of the program. It is important that the same methodology and input sources be used. Our coaches work with each leader to complete a development plan and a program evaluation report, using a rating scale of 1-10. This provides a sufficiently granular measurement to show meaningful progress (or not) and provides the company with sufficient program data for appropriate evaluation throughout the engagement. In some cases, there might be additional metrics for progress that are unique to an individual. In each case, we will work with our coaches and they will work with their leaders to identify and track from 3 to 5 measurements that align with their specific developmental goals. As personal performance has become more important over the years, many organizations are realizing the benefits of “Shadow-Coaching.” During a Shadow-Coaching session, the coach follows the leader for a prescribed period of time, such as a half-day, one day, or two days, and observes the leader’s actions. Afterwards, the coach provides insights, advice, and other feedback. Coaches may comment on anything, from how the leader organizes his or her day to how well he or she interacts with co-workers and management. 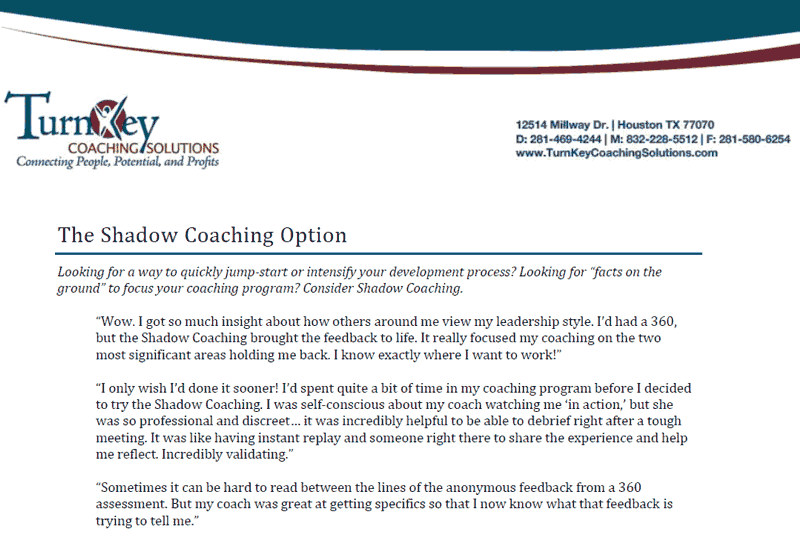 We recommend the inclusion of Shadow-Coaching into the design of your program. Its value is in circumventing the leader’s self-image. It enables the coach to present a mirror in which the leader is accurately reflected. This allows the leader to gain valuable insight into how other people perceive them. Shadow-Coaching should be used to augment traditional coaching sessions, not replace them. For more, please see also “shadow coaching”. A minimum of six to twelve months is considered a “best-practice” on the duration of a coaching relationship. Consistent coaching over time provides for optimal beneficial impact on the leader and supports the sustainability of the program. We have shorter EQ and Awareness coaching programs of 3 months. In addition, we have comprehensive Leadership University, targeted development, and on-boarding programs of 12 to 18 months. For emerging leader and executive development programs, six to 12 months is the typical duration. Our recommendation for duration will vary according to the set of design features that you choose. We custom design for you, so if you stipulate that the duration be a certain length, we will design your program accordingly and advise you of the best features to include within that constraint. Once you have designed a program for us and we have begun it, is there a guarantee associated with your services? Your satisfaction is guaranteed. TKCS provides a 30-Day, 100% guarantee. If you are not completely satisfied with your coaching program, then all you need to do is let us know within the first 30 days and we will unconditionally cancel the program and fees will be refunded on a pro-rated basis. Additionally, at any time throughout your coaching program, should one of our coaches not meet your requirements, a new coach will be assigned immediately. This process will be repeated until you and the leader are satisfied. Our mission is to make you and the leader not just satisfied but enthusiastic about our coaching program and the professional coaching experience. We have a proven 4-step process that accelerates implementation and keeps your required level of effort streamlined. Objectives and Critical Success Factors: We meet with your team so that we can understand your objectives and learn “what success looks like” to you. You will describe assessments, tools, and other resources that may be useful. We will describe to you the components and options that fit with your objectives so that you may consider them for inclusion. Program Design: We submit the Program Design to you for review and approval. If accepted by you, the cost of the program may need to be modified up or down in accordance with the provisions of the contract. Communicate with Leaders: You give us your leader’s contact information and background information. We send the survey questionnaire to them via email. We will attach any descriptive material that you prescribe to apprise them of the program and the process. Coach Assignment: Based on responses to the questionnaire, the right coach or coach team is matched with each leader, subject to your approval. If the program includes coach interviews, the leader selects a few coaches to interview and then selects one of them. The coach then contacts the leader to arrange a “Rapport Building” session to introduce him or herself and establish the coaching relationship. The coach and leader both assess “chemistry and fit”. If there is a good fit, the coach and leader arrange their first coaching session.